The product's power supply is US plug, We can provide UK/EU/AU Adapter after you leave a message.If not leave message,No adapter or Random Adapter provided! This mini powerline adapter extended the network transmission to home power line, using existing power line without additional wiring, just plug and play. With up to 200Mbps transmission rate, it can provide fast streaming HD movies, online multi-player games, other data intensive activities. Powerline Adapter extended the network transmission to home power line, using existing power line without additional wiring, as long as there are power outlets, two adapter can support simple and convenient network connection. 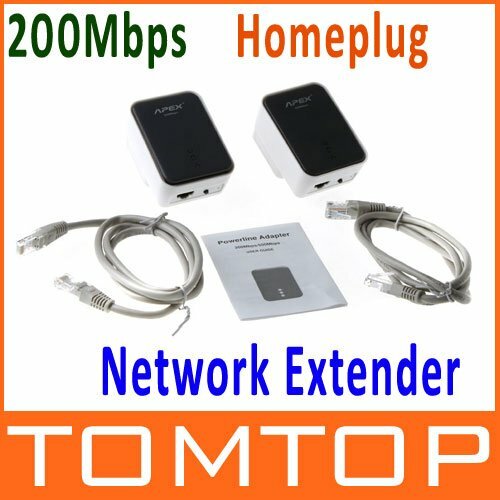 Powerline Adapter transmission rate up to 200Mbps. Transfer distance up up to 300 Meters. Support QoS, enable stable and high speed network for online game, IPTV, and multimedia application. Powerline Adapter supports 128-bit AES encryption, with simply operating can establish secure connection ensure the secure of data transmission. Using pair button you can set up private network between multiple adapters. Power saving. built-in intelligence to detect, when the device is shut down or standby mode, it will automatically enter power saving mode, you can save up to 65% power. Compact, extremely mini, beautiful appearance. Sale! 7.2M 3g gsm modem support voice call hot sale!